Do you want to dramatically improve the home heating capability of your wood stove? By adding a metal hood cover and duct work over your wood stove you can direct the heat radiating from your wood stove directly to the upper levels of your home. The “Installation of Hood over Wood Stove Ebook” will show you how to build and install a wood stove metal hood cover to maximize the heating benefits of your wood stove. The “Installation of Hood over Wood Stove Ebook” provides detailed, yet easy to follow, step-by-step instructions for installing a wood stove hood cover, duct work and fan assembly. Pictures are included in every step of the process! 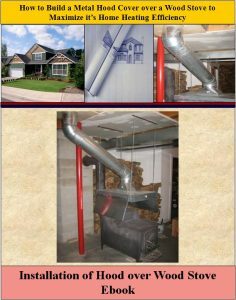 The Installation of Hood over Wood Stove EBook costs only $11 and is 100% guaranteed. Save on Home Heating Bills Today! !